Free Shipping Included! Activity Fitness Tracker + Mobile Alerts + Storage Smart Jewelry Bracelet for Women, Lavender Leather by Ela Fine Tech at Kode Fu Guru. MPN: ZRB036611WLV155. Hurry! Limited time offer. Offer valid only while supplies last. We're bringing back elegance and manners, allowing you to connect with your tech in a way that doesn't interrupt your face-to- face interactions. Material : Your Smart Bracelet is made from Stainless Steel. The center stone is made of Italian marble quartz paired with LED technology for a subtle soft illumination effect. 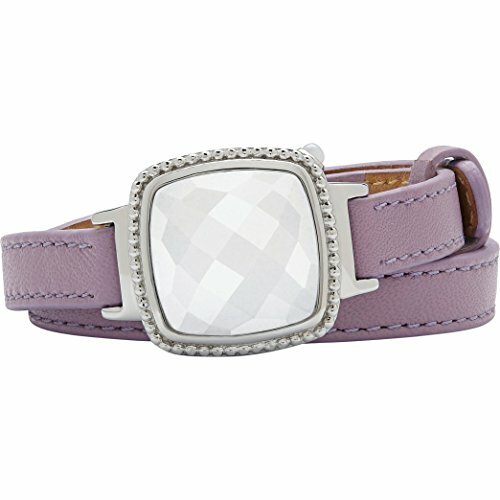 The strap is Lavender in color and is made out of fine quality real leather.